TL;DR: If you want to build your business online for the long term and really win, hire a community manager. A person who is in charge of knowing, understanding, and keeping up with your community. They will be the main link builder in your company, only they'll do it the right way, the sustainable way. I wrote a post a while back about rules for outsourcing in SEO in which I laid out how to outsource multiple parts of business related to search, but this post was written in the case of one in-house marketer. In a perfect world, each one of those areas I mentioned like content development and social would have their own teams internally. Today I want to talk specifically about link building which is the one thing most companies have issues with from what we can tell from potential client needs. For those of you that have some more time to read, we'll explore what I mean by community manager, what traits are needed, and why this is so important to your online marketing success. The team at Distilled are fans of our own clients doing their own community and relationship building. While Distilled (and similar consultancies) can help get programs going and prove success, the company itself is always the best place to start and maintain the relationships needed for links, PR, and social interactions. Most of the potential clients we talk to about link building as a service tell us that they don't have time to do "link building." The first thing I want everyone to understand is that what we call link building now (and in this post) is not what we used to understand as link building. I personally think that old process of is on the endangered species list. If you are in-house and having issues with getting links to important pages to your site, it's not traditional link building that you need help with. You need help with integrating linking with your other marketing efforts. Once your company understands that, link building will get easier and more cost effective. There are already people that are being paid to develop key relationships. Your executives, PR team (if you have one), and customer service people all have key contacts that can bring you very powerful links if you know where to look. C-Level Executives - these people all have business contacts with related companies. In any business deals, there should be some talk about if the relationship is public and if it is, there can be announcements about the relationship. Work with the other company to talk about each other in terms that are useful to each other's customers. PR Team - This is simple, they are the key to big links. PR people just need to know what to link to. They need resources to pitch. Customer Service - These are the people that talk to your customers everyday. They are relationship builders and fixers everyday. Talk with them about who your best clients are, big issues, and brainstorm what would make your customers happier. These are the people that know. Social Media Team - If you have someone or a team in charge of social media, they know who the influencers are already, or should. Work with this team to identify and help build the relationship. A Community Manager should work with this team hand in hand, as well as PR and Marketing. So why pay for a team? That's what I'd ask as a CMO or CEO. If we have these people, why should we build a new team? Put simply, the current people you have target a specific kind of contact. We at Distilled build relationships with bloggers, not major journalists or business contacts. Bloggers are simply potential brand advocates with a blog. We develop those relationships for clients, sure, but it's best for the client if those contacts are with the company. Keeping up with brand advocates should be the job of someone in your company—and not just socially. These are important people that develop sales for you without being paid. You should be investing in them as a resource and a team should be centered on that, social media being a big part of that. You have paid people that are dedicated to journalists, why not for the people that love your company without asking them to? Hiring an in-house community relations team is a long term strategy. It's an investment in your company's future that I guarantee few of your competitors are doing. If you want to win in online marketing, you have to have people talking about you to their social networks. It's best if that is done in house. A community manager is someone that hopefully leads a team of people that are the intersection of customer service people, PR people, and business development people. This can start as one person working with others within the company or external parties, but they are in charge of the relationships of the company. As I said before, social media is a big part of relationship building, so working with social media or sitting on the social media team is necessary. The easiest place to identify and start online relationships is through social media. But the social media team is usually focused on metrics like fans and likes. Someone needs to be in charge of developing the relationships past talking and sharing on Facebook or Twitter. This person or team should also work very closely with the PR team, or if it is outsourced, the consultants there. These people have tons of contacts with journalists. They are great at pitching stories and generally keeping up with people. This person or team is going to have to work with PR to ensure they aren't overlapping with each other. Let each cater to their best contacts. This person or team should have access to all executives and business development to leverage the contacts there so that even when the deal is done. Once the papers are signed, the business development person typically moves on. They might keep up with the relationship but it's doubtful someone keeps up with them to solicit ideas about the partnership and how your company can make it better. Those relationships can be utilized in the future to glean ideas and develop future campaigns that can benefit both companies. The best way to identify possible opportunities like that is to stay in touch with them. This manager and/or team then works with the different parts of the company and marketing to brainstorm marketing ideas utilizing any and all of the contacts the company has. This person is part of all these teams, they don't take over contacts, they just build new ones and help make existing contacts more useful in terms of marketing, online and offline. Hopefully by now you are sold on this new addition to your team and you have the ammo to sell the position to decision makers. Say you get buy in, what should you look for? I'm not going to go into specific job descriptions but these are the traits we think are best for someone in this position. This is the bulleted list, you can get more information on the characteristics of a link builder here from Adria, our Outreach Manager. Outgoing Personality - Enough said. Understands social media, the conversations and how to build relationships. Just having a social media account and a few tweets doesn't count here. They should have stories about meeting up with people and how that has benefited projects in the past. Patience and Persistence - This is paramount. Relationships are not built overnight. This person is going to have to be able to keep up with someone over time. They won't get results immediately, but that is expected. The company needs to understand this and they need to have the resilience to build the relationship, not just go after the link. Ability to Listen and Act Creatively - Building relationships is about getting to know people, becoming a part of their day, and helping them when needed. A community manager is going to act as customer service as well as one of the voices of your company. They need to be able to listen to issues and people's everyday lives and be able to become a part of that without bugging people. It's a fine art and something that isn't predictable. They need to be able to go with the flow. Tough Exterior and Confidence - Community managers need to know how to take a strong "no." There are going to be people that get upset at them. This is to be expected and the manager needs to know how to let it roll off their back. They also need the confidence to make decisions and protect the needs of the community. I hope this helps you understand why a community manager type person is so important for all businesses. If you don't have this person already, I'd work to ensure that they are on the wishlist for 2013. This can mean increases in rankings and links, but more importantly traffic and sales. Having someone in charge of your relationships and cultivating them is the most important thing you can do for your website and SEO efforts. 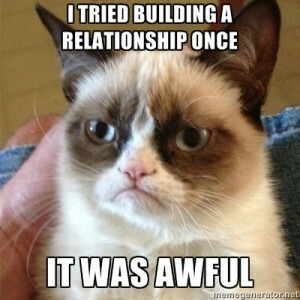 Thanks to Distilled Outreacher Alyssa and Meme Extraordinaire Dallas for the Grumpy Cat inspiration.